Content marketing is a term that has been bandied about for years within Marketing Departments however it can mean different things to different people. There is no denying that ‘Content Is King’ when it comes to digital marketing; you can have an impressive looking website, but if you don’t provide content with value on that site to visitors then very little will happen. Equally when it comes to social media, we as content consumers, are less concerned with which page the post comes from, and are more interested in what the post says and how it makes us feel. In this day and age we are exposed to thousands of marketing messages on a daily basis and we actively search online for news and information to shape our decisions and form opinions. As a society we are actively looking for and consuming content, so if you do not have a suite of content to inform, educate and persuade your current and potential customers then you are loosing out to competitors. In 1984, a person saw an average 2,000 ads/day. By 2014, they saw around 5,000. Almost half of 18 to 49 year-old people get their news and information online and those numbers are growing. Ideally we should have effective content in all the places where consumers interact with our brand; on our website, on social media, on SERPS, through PR and via Paid For Ads. Now we have a basic understanding around the concept of content marketing, it’s time to take a look at the various types of content that you can use in your business to get started. This means that content formats will differ based on your objectives for that piece. 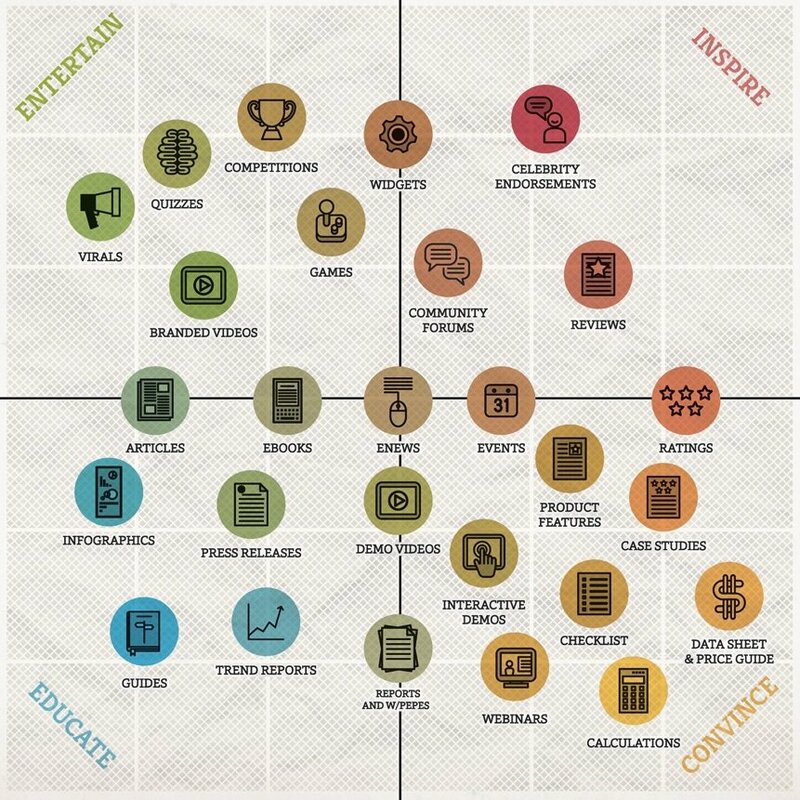 The Content Marketing Matrix from Smart Insights. The brain processes visuals 60,000 times faster than it does text. We are wired to take in visual content faster and more effectively than we are words. 63% of social media is made up of images. That is 2/3 of the updates you see on social media are visual content. Content with relevant images gets 94% more views than content without and using images on Twitter in your tweets means you get 35% more retweets! Infographics enable you tell a data heavy story in an easy to read visual format. Designed as charts or graphs, it can make it easier for your audience to comprehend your message than with text only. QuickSprout research reveals that articles with data-driven visuals rank fourth in shareable formats and blog posts with graphs and charts receive more trackbacks – 258% more than blog posts with other types of images. In a nutshell, search engines like to see websites that are frequently updated, again showing that they are constantly providing value to the visitors. Whilst it’s highly impractical to update every product page on a daily or even weekly basis, it is a lot more feasible to write and publish blogs which are articles and opinion pieces hosted on your website. Blog posts can be shared across digital channels to gain further amplification and reach new potential clients. Opportunities for guest blogging should be explored with relevant industry leaders and influencers. Blogs are a great way to get traffic to your page as they can engage with smaller groups of people around specific topics related to your brand. A podcast is a digital audio file made available on the Internet for downloading to a computer or mobile device, typically available as a series, new instalments of which can be received by subscribers automatically. Podcasts are a great way to share insights, discuss factors relevant to your brand and collaborate with industry influencers over time. Check out my Top Content Marketing Tools post to learn about new tools that can help you develop content for your brand. Tell us below, which content formats do you use most often and what results do you see from these? » Content Marketing, Marketing	» What is Content Marketing and How Do I Get Started?